My university library had a massive stack of printing industry annuals from the 1890s through to the 20s. I always enjoyed looking through them because the illustrations and articles they chose to showcase new printing technologies were often really odd, and were good to photocopy for collages and zines. Next to them on the shelf was a strange little book called Professor Knatschke. 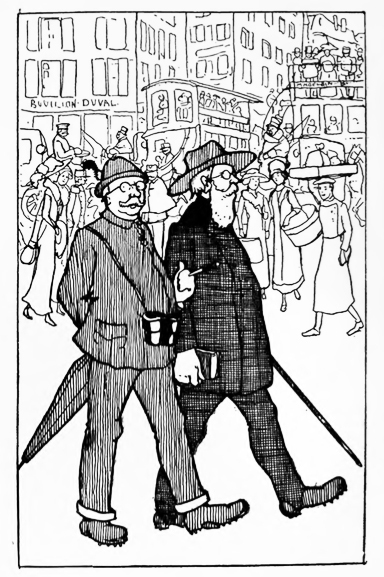 It’s a comedy book written and illustrated in 1912 by Alsatian satirist Jean-Jacques Waltz, aka Hansi, about a clueless German professor and his daughter’s trip to Paris, mocking both the French and the Germans (but mostly the Germans) in a more innocent pre-WW1 pre-Nazi era. I always really liked the illustrations (and Elsa K’s obsession with making gifts embroidered with “inspiring” mottoes) , and now it’s available free online as a copyright-free ebook.